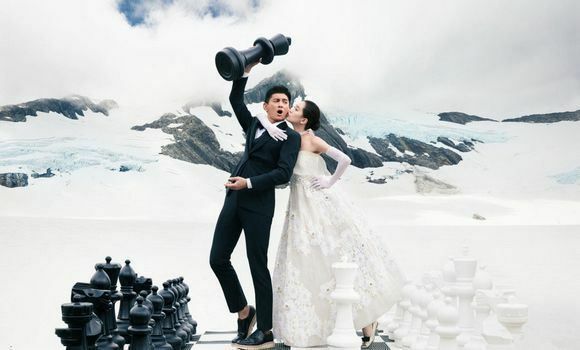 I saw the drama version of cherubic angels singing hallejuah when I laid eyes on the wedding pictorial of TW-actor Nicky Wu and his C-actress wife Liu Shi Shi. The two have been legally married since last year when they registered their wedding, but in Chinese culture couples aren’t married married until they have the wedding ceremony with family and friends. Shi Shi and Nicky finally got around to planning their wedding which will reportedly be an expenses paid for all guests destination wedding in Bali on March 20th. 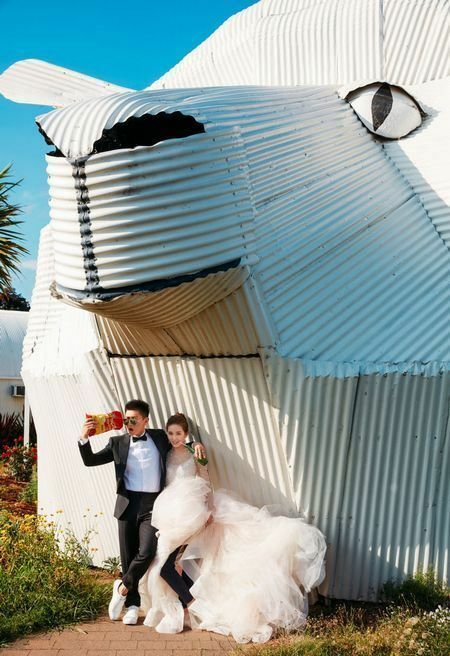 The couple went to New Zealand to shoot their wedding photos and the result is fun and fabulous overload. They look soooooooo beautiful and happy! Seriously, every Bu Bu Jing Xin fan is wiping away tears of joy right now. It’s only sad that internet trolls have not let up on attacking their 17 year age gap union yet the couple truly has a IDGAF atttude and I applaud them for it! Love away, Shi Shi and Nicky, and may you up the fandom goodies by giving us all a little Nicky or Shi Shi sooner rather than later. squuueeee! One of the best celebrity pre-wedding shoots ever. It has everything – couple clearly in love, having fun and posing in such harmony with the beautiful backdrop of NZ. Kudos to the photog. And the 17-years age gap does not show at all! I like Nicky Wu as a person, not so much as an actor. LSS is a pure beauty both in classical and modern way. She obviously has a great sense of aesthetics, imo. I love her fashion style. This is so pretty, and I’m so happy for them. After the tears of blood that was shed over Bu Bu Jing Xin’s ending, this is like a balm to the hearts of their fans. I wish them a very happy life together, and may they not cease to find reasons to smile at, and laugh with each other. My fave celebrity couple ever. I hope they will have a lifetime lasting marriage and become the Paul Newman – Joanne Woodward of C-biz. Shi Shi looks absolutely stunning in this wedding dress. I think her beauty shines much more in modern styling. They are lovely together. Much happiness to them. awww….they both are so cute and beautiful. The first and Lui Shi Shi picture was breathtaking! The others were cute and funny. Wish them the best and of course, wish to see a Nicky Jr. soon!!!! Age difference by gone. True love always win! Beautiful! Been watching them on BBJX lately and totally in love! So happy for them! When I first saw the photos on Weibo, I started getting teary. Si Ye and Ruo Xi are getting the happy ending that they deserve! I love that geyser shoreline. Congrats to the happy couple! the guy look more like her father.then husband.